The Licker Returns in Resident Evil 2 Remake Gameplay Trailer | Nerd Much? If you’ve ever felt like pooping your pants in the middle of a Wednesday afternoon, boy do we have the video for you. Capcom dropped a fresh Resident Evil 2 remake gameplay trailer today. And on full display within the clip are the infamous Lickers that have been terrorizing folks within the Resident Evil series for 20 years now. Resident Evil 2 remake gameplay trailer sees Claire Redfield exploring the Raccoon City Underground Laboratory just as she originally did in the initial 1998 game. 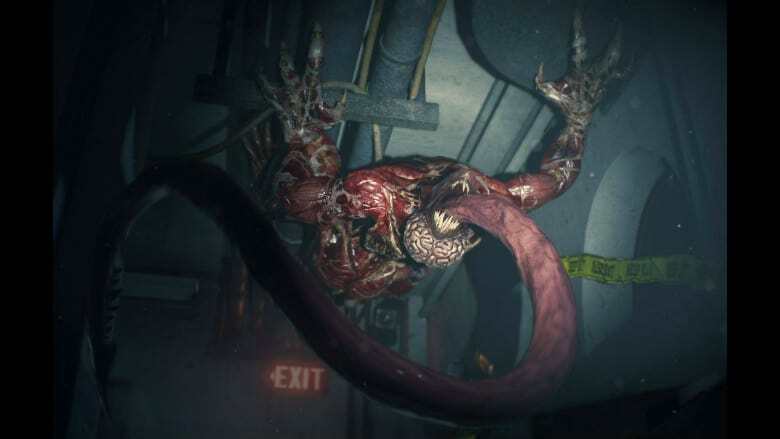 It takes a mere 20 seconds of Claire exploring the Laboratory halls before she lifts her flashlight at a nearby wall and shines light on one of these long-tongued horrors. It quickly scampers away, but we all know we’ll be seeing it again. Claire turns the corner anxious to track down our newfound friend. There’s a large pile of debris in the way ahead, so instead, she opens the door she finds to her immediate left. And behind that door, to absolutely no one’s surprise, is one of these damn Lickers once again. This one fully engorging himself on pack of Cerberus that it recently took out. The Resident Evil 2 remake gameplay trailer then sees the Licker turn its attention toward Claire. She turns her attention toward getting the hell out of there. As she slowly creeps away, she rounds a corner and – BAM – another damn Licker hangs from the ceiling. She takes a hit and books it towards the nearest door. Ms. Redfield then makes her way to a nearby morgue room and begins opening the refrigerator doors. Great idea, Claire. Great idea. The second one she opens houses a recently deceased man, and it doesn’t take long for him to reanimate and then come rushing towards her. She fires a few shots, turns to run, and finds another zombie happy to take a large chunk out of her next. She then throws him to the ground and makes her way back to the door figuring the Lickers outside are easier to dispatch than a couple of lumbering zombies. It doesn’t take long before she finds new pals. It’s go time for Claire, unleashing shotgun, SMG and pistol bullets to little effect. She dodges and weaves, gets taken down but fights back with vicious knife to one of the Lickers’ necks. It falls to the ground in pain but creepily arises shortly thereafter like something straight out of the Exorcist. …that is until you pick up the sticks for yourself and play the Resident Evil 2 remake when it arrives for PC, PlayStation 4 and Xbox One on January 25th.